Lucknow maybe famously known as the ‘city of Nawabs’ but for food lovers, it is the ultimate hub to savour spice loaded kebabs, aromatic biryanis, and chat-pata chaats, among other lip-smacking delicacies. It is a food lover’s paradise. You can literally dedicate each day to trying a different category of food, and it wouldn’t be surprising to find ‘chaats‘ feature among the top in your list. 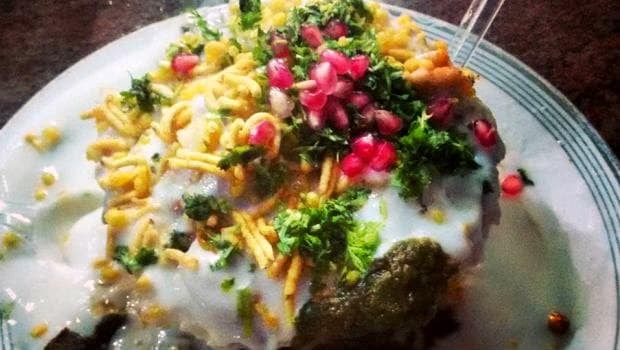 Lucknow’s chaats have a huge fan following, and one of the most popular chaat items that come highly recommended is the Tokri Chaat or Basket Chaat. As the name suggests, the chaat literally resembles a basket which is overloaded with a whole bunch of ingredients, which no doubt make it an indulgent affair, and an immensely satisfying one too. The tokri or the basket is delightfully crispy, and it is made by deep-frying grated potatoes using a mould. The crispy tokris or baskets are then used to plate the chaat. 1. Aloo Tikki: While Aloo Tikkis are also used to make a chaat type of its own, in Tokri Chaat it finds a place again to elevate its overall flavour. The little tikkis are of course made of potatoes along with peas, onions and a handful of masalas, which are then pan-fried. 2. Papdi: The disc-shaped crisps called papdi are a favourite ingredient in Indian chaats. Made of refined flour and oil, they are included in chaats to lend some crunch or texture. 3. Bhalle:Bhalle are nothing but lentil fritters which are soaked in water for a few seconds right after they are deep-fried to drain out the excess oil as well as to make the fritters soft. 4. Chole or Chickpeas: The chickpeas are soaked in water overnight and then boiled before using it in the chaat. It again lends more texture to the chaat. 5. Dahi: Chilled and sweetened dahi or yoghurt is what makes this chaat relishing, by not just adding richness but also a medium to bring together all the flavours. 6. Saunth or Tamarind Chutney: No chaat is complete without adding one of the most popular Indian chutneys – saunth, also known as tamarind sauce or chutney. It is made of tamarind, jaggery, red chilli powder and salt, which adds sweet-spicy-sour flavour to the chaat. 7. Green Chutney: For spicy food lovers, the green chutney is a favourite side. Made of pudina and dhania leaves, along with green chillies, onions and salt, it is what turns up the spice level in the chaat. 8. Sev: For instant crunch, there’s nothing better than sev. Just a handful of it is enough to make the whole experience a delightfully munching affair. 9. Boiled Potatoes: Boiled and cubed potatoes also go into the tokri, just like boiled chickpeas. 10. Masala: Now, different vendors use different mix of spices to spruce up the Tokri Chaat. While some refuse to reveal their secret spices, the most common ones that are usually used include chaatmasala, dhania power, red chilli powder, amchoor and jeera powder among others. 11. Pomegranate seeds: These ruby-red seeds not only make the chaat look beautiful, but also add a little amount of sweetness (much needed) to the chaat. 12. Grated carrots: Grated carrots are added to the chaat as garnish. 13. Coriander Leaves: finally, before serving the Tokri Chaat, some chopped coriander leaves are sprinkled on top to add some zing. Tempting much? Well, perhaps you need to start planning your trip to Lucknow soon to bite into it and enjoy the myriad flavours that make the Tokri Chaat a lip-smacking treat.